The Republican Main Street Partnership, a Washington-based group that has promoted moderate GOP lawmakers and policies, will remove the word "Republican" from its title and welcome center-right Democrats in 2013, Yahoo News has learned. The organization's board of directors voted Tuesday morning to scrap party identification from its title and be known simply as "The Main Street Partnership." 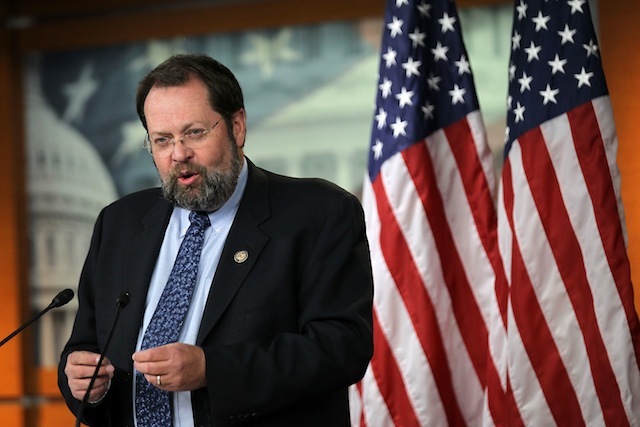 The group's new president, former Ohio Republican Rep. Steven LaTourette, told Yahoo News that he plans to begin conversations with Blue Dog Democrats and centrist groups in the coming months. "The goal is to try and fill the void that is the middle," LaTourette, who resigned from Congress this year, said. "The American political system is like a doughnut: You've got sides, but you don't have anything in the middle, and it would be my goal to work with Republicans and Democrats who want to find the path forward to getting things done and compromise." In a statement released Tuesday afternoon, LaTourette added: “While we have changed our name, we have not changed our values or our mission. We will continue to be a right of center organization and continue to represent the governing wing of the Republican Party." The Main Street Partnership will also expand its super PAC, Defending Main Street, that will fund Republicans moderates, LaTourette said, adding, "It's not going to be focused so much on party as it is on protecting people from the right and left extremes if they choose to do the right things." In Congress, LaTourette was known to vote against party leadership: He opposed a measure that would strip federal funding of National Public Radio in 2011, and he was one of just two Republicans who did not support censuring Attorney General Eric Holder. Current members of the Main Street organization include Republican Rep. Dave Camp of Michigan, chairman of the powerful House Ways and Means Committee, Republican Rep. Fred Upton of Michigan, chairman of the House Energy and Commerce Committee; and Republican Rep. Cathy McMorris-Rodgers of Washington, who was named chairman of the House Republican Conference in November. Update: An earlier version of this article reported that LaTourette said the group's super PAC would be open to funding Democratic campaigns. LaTourette later said he misspoke and that while he is willing to work with Democrats, the super PAC will only fund Republicans. This article has been updated to reflect that.